Today is the optional memorial of St. Ephrem. He was a deacon who wrote many sermons and songs. He is one of the 33 doctors (teachers) of the Church. St. Ephrem pray for us. As I was looking at icons of St. Ephrem today, since he is the patron of this website, I noticed that the icon I had at the top of the site was of St. Ephraim, a completely different person. I replaced the icon with one of St. Ephrem, but I am grateful for all the prayers of St. Ephraim as well. St. Ephraim, pray for us. I like the icon that is up now very much. Not only is it of the correct saint, but it shows why St. Ephrem is the patron of this website. He was a deacon and also a blogger. Of course, there was no internet. I say that he is a blogger because he is known not for writing long books but for writing many short pieces. One common post of his would be to take a song written by the heretics, fix the lyrics, and republish it as a song for faithful Catholics. 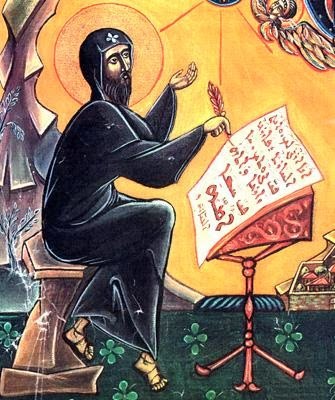 I consider the current icon to be an icon of Saint Ephrem in the middle of blogging.